Koh Pha-Ngan is popular for its Full Moon Party, but there are a lot of other things that you can do on the island. Staying at Villa Sand Shine will offer you the chance to explore the island quite conveniently as you can get around from there. The villa itself is located in a quiet neighborhood, surrounded by lush green forests. The two-bedroom resort is ideal for couples, families, and even friends. The villa offers quality amenities and services for a comfortable and memorable stay at the villa. The air-conditioned master bedroom features modern décor and floors with a marble finish for some opulence. The room is well-furnished with a king-sized bed, a single bed, ottoman, and a workspace for those who wish to get work done. The room leads to the terrace which holds a dining table for you to enjoy your meals or even a cup of tea in the evenings as you look out towards the beautiful panorama. The en-suite bathroom is a brightly furnished room with indoor plants and a shower area. The second air-conditioned bedroom has large windows that give you stunning views of the lush greens outdoors. The room is furnished with a king-sized bed for the comforts of its guests, a desk, and a safety deposit box. The en-suite bathroom is fitted with necessary amenities and has a large shower area. Outside the main living pavilion is mainly dense and thick tropical vegetation so that you feel like living in the heart of a forest in your personal oasis. The swimming pool is a striking feature of the villa with a big happy face on its tiled surface that you can spot from afar. You can lounge in the pool while breathing in the fresh, tropical breeze and the hot sun that will work wonders for your tan. Numerous sun chairs line the pool deck so you have a space where you get to lie back and take a deep breath after a swim. The main living pavilion is housed under a thatched-roof sala which is a traditional Thai architecture for a more authentic experience for the guests. 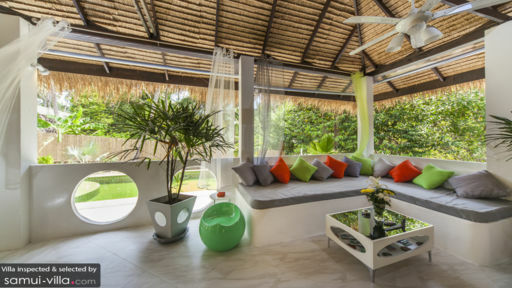 The colorful décor adds a vibrancy to the room and the open-concept allows for the fresh air to ventilate the space. The high, alang-alang roof and the sandstone walls and floors create a village hut-like ambiance giving you a calming space to relax in. There is a large wall-mounted TV and comfortable sofas in the room. Ceiling fans keep the pavilion cool and comfortable and the natural sunlight illuminates each and every corner. 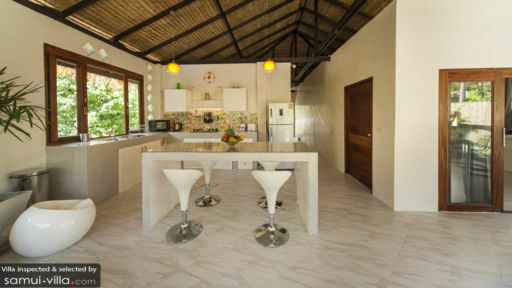 The dining table is, in fact, the island top of the kitchen which is furnished with high chairs for guests to sit on and relish their delicious meals, prepared by the house chef with love. The traditional décor enhances the cozy ambiance. The western kitchen is fully-equipped, and fitted with modern appliance, for your convenience. The empty spaces allow for easy movement everywhere in the villa, so there are no obstructions and disturbances in your tropical adventure! The villa staff has a housekeeper to maintain the upkeep of the villa as well as an assistant to help you get settled in. Upon request, the villa staff can make arrangements for transportation for around the island and even book excursions or in-house massages for the guests. Koh Pha-Ngan is a beautiful island in southeast Thailand and known for the famous Full Moon Party. There are other things you can do here including the Thong Sala Night Market and the Herbal Sauna Baan Tai. 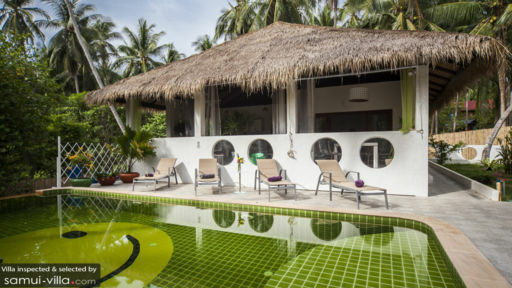 The villa is a mere kilometer from the beach so you can partake in watersports and go swimming!